India today sent an unambiguous message to the international community when Prime Minister Manmohan Singh proclaimed that all facilities procured by New Delhi in future through international cooperation on civilian nuclear energy will be subjected to IAEA safeguards. 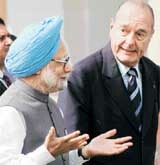 India and France today signed nine bilateral documents in the presence of Prime Minister Manmohan Singh and visiting French President Jacques Chirac. Has primary healthcare in Punjab suffered due to privatisation? The Maharashtra Government today quarantined three babies for suspected bird flu in Nandurbar district, health officials said here today. The bold initiative of Prime Minister Manmohan Singh to invite the mainstream parties and separatists for a round table conference at Delhi on February 25 to hammer out a solution to the Kashmir imbroglio has suffered a setback with the Hurriyat Conference, considered as the voice of the separatist parties, today rejecting the invitation. Haryana Education Minister Phool Chand Mullana today ordered the suspension of the District Education Officer, here, Mr M.R. 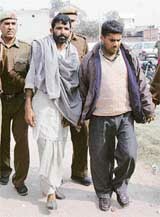 Sharma and he said that the entire school staff would be transferred, where a teacher had raped a Class VIII student in Chudiala village on Saturday. We are totally opposed to division of people in the name of Hindus and Muslims. 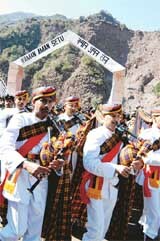 There has been no provision for reservation in the armed forces. The Congress-led UPA government today came under twin attack in Parliament during the debate on President’s Address with the Left giving a veiled threat to the UPA government on the Iran issue and the BJP criticising ruling combine’s economic policies and targeting Prime Minister Manmohan Singh and UPA chairperson Sonia Gandhi on the power equation within the coalition. The BJP-led Opposition today demanded the resignation of Prime Minister Manmohan Singh over the Supreme Court’s adverse remarks against the Centre for the manner in which the Bihar Assembly was dissolved last year. Mumbai police’s encounter specialist Sub-Inspector Daya Nayak today surrendered before the Sessions Court before the expiry of a 12-noon deadline ordered by the court. Disappointed over “little enthusiasm” in the movement of people across the LoC by Srinagar-Muzaffarabad bus service, Chief Minister Ghulam Nabi Azad here today said that trade along the route would be started within a couple of months.